Best way to choose a movie to watch? In a corporate boardroom, four men in suits discuss the next item on their agenda: "Should we or should we not... kill the Jews?" A film for our time, or any time. A Modest Suggestion examines in a matter-of-fact way, the prejudices and simple mindedness of some groups of people. Unfortunately, it is a global problem that no society is immune from. 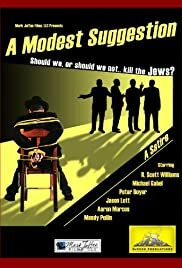 AMS puts forth the absurdity of prejudice by breaking it down to the nuts and bolts of a specific prejudice (against Jews) by exhibiting the clichés that are usually associated with the Jewish people. These simple minded reactions to feelings about Jews can be transferred to any other group of people, albeit with a different list of "gripes and grievances." Oddly enough, the message of the script cuts through in a bold satire, which is about as dark as they come. AMS delivers on entertaining and promoting thought provoking conversations because of the blinding bareness of truth that the film exhibits. Moreover, a wonderful cast, score, and an in-your-face production, sharpens the message.